Happy Registered Dietitian Day! Hope my RD friends and colleagues enjoyed some well-deserved recognition. For the self-employed chef RD, I earned another day in the kitchen, and an inbox reminding me of my special holiday. In honor of the holiday, I decided to keep a food journal to share with the blogosphere. Food journaling is something I usually ask of the clients that I counsel. Journals offer the RD a peek into her clients’ diet psyche…should they choose to be forthcoming. I’ll admit that my day begins smoothly, but things start to get more interesting at 4pm. And eating ends on a high note–check out my dinner pics & recipe! 11am: Prenatal yoga, which is making me very hungry. Thinking of lunch. 1pm: On the train to a client’s home. One Lifesavers Pep-o-Mint. Some water. Baby is kicking. 4:15: Baby is kicking again. Noted, likes cookies. 6pm: On the train. Another Lifesavers Pep-o-Mint. No one is giving up their seat for me tonight and my belly is practically thumping with baby kicks. Really hate the F train. 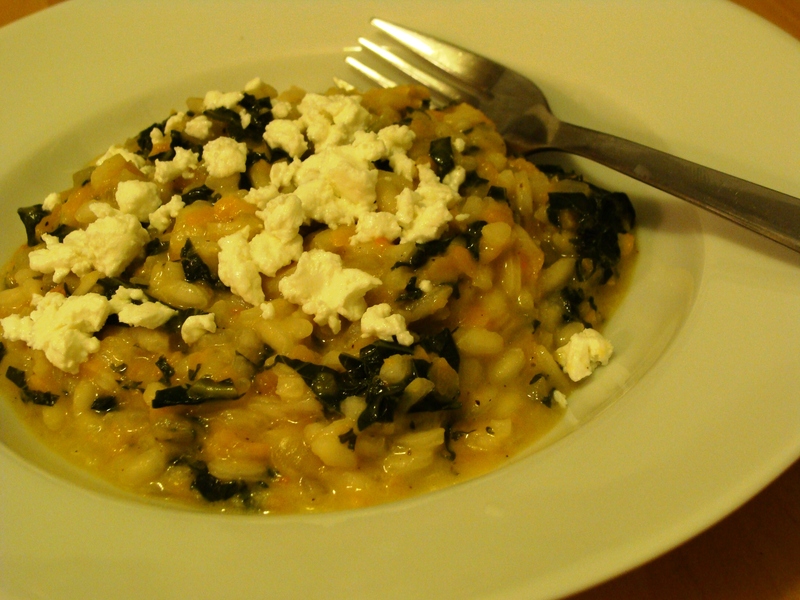 7:45: Kale and butternut squash risotto with goat cheese. Cleared the pantry of Arborio rice. Cleaned our plates. 10pm: One Liberte low-fat peach yogurt with 1/4 cup blueberries. Sweet Madeira wine (what was open in the fridge) found a tangy partner in goat cheese, and some spice with freshly cracked black pepper. Heat chicken stock on a back burner until simmering; turn to very low heat. In a medium pot, saute onion in olive oil until transluscent, about 3 minutes. Add rice and stir until well-coated, 1-2 minutes. Add wine and stir until evaporated. Add 2 ladles-full of hot stock to rice pot. Stir until liquid is almost absorbed. 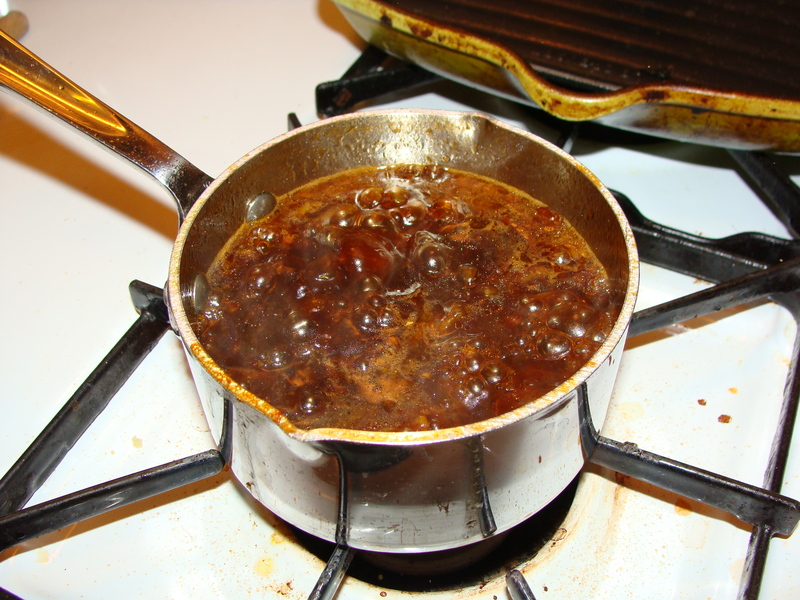 Add more stock, one ladle-full at a time, and stir until liquid is absorbed. After 10 minutes of stirring, add the kale and squash. Continue to add liquid and stir continuously until all liquid has been incorporated and the rice is al dente, about 18 minutes. 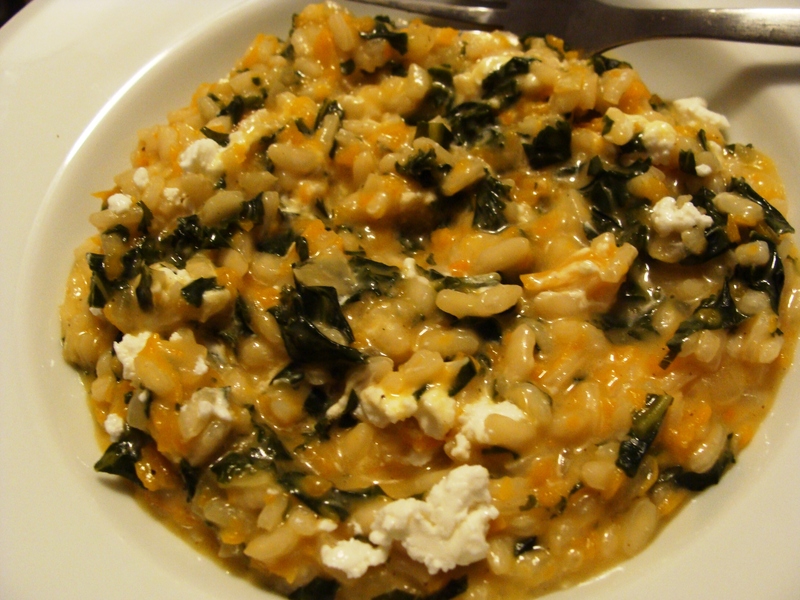 Add butter to the rice and stir vigorously until risotto is creamy. Add 1 oz goat cheese and stir until melted. Add fresh-cracked black pepper to taste. This winter I’ve taken refuge in citrus. While piles of snow and gloom are being dumped on Brooklyn, I’m cozying up to clementines, tangelos and navels on my sofa. Just counting my days of apartment captivity in orange peels, waiting for spring to arrive! So perhaps the best thing about citrus season is once you get bored with the peel & eat varieties, some clever grocer puts grapefruit on sale. Grapefruit, while notoriously bitter, is the most gorgeous citrus in my opinion (someday I will walk into a Benjamin Moore with a halved pink grapefruit asking for a color match). Usually all it takes is a special serrated knife and a drizzle of honey to get around the pith and much of the bitterness. Grapefruit takes kindly to heat and a little broiling or boiling can also bring out its sweetness. I adapted the following recipe from Kyle Shadix’s Grapefruit Teriyaki Glaze that appeared in the winter ADA Times magazine. In a small saucepan, saute onions and ginger until soft. Add orange zest and juice, grapefruit juice, soy sauce and sugar; bring to a boil and cook for 10 minutes. Turn off heat. Add oil to the sauce. Blend mixture until smooth. Couscous soaking up the sauce, mmm. 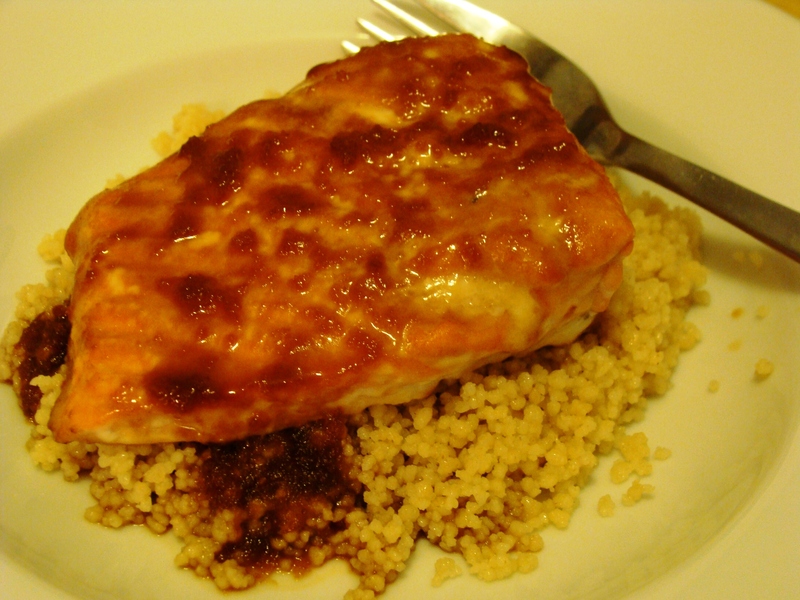 Place salmon fillets on a parchment or foil-lined baking sheet. Brush the salmon with the warm sauce until well-coated. Bake 5 minutes, brush on more sauce and then bake another 4-5 minutes. 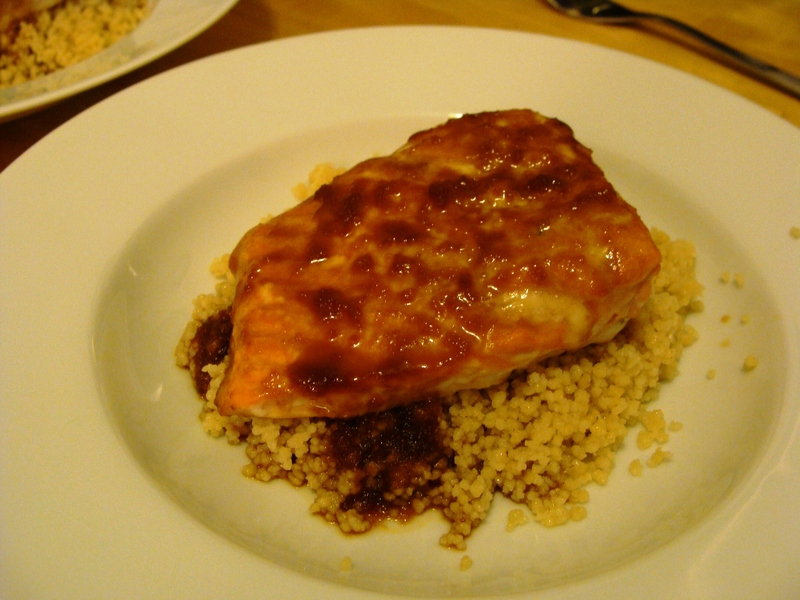 Serve over rice or couscous, and spoon over additional sauce if desired.